Imagine a cute picture of asha investigating my shower. She hopped in there after I took a shower this morning. 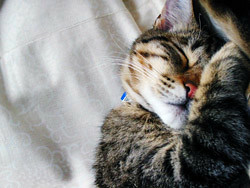 You all would have seen a cute photo, but my camera batteries needed to be recharged. lame. I've decided I'm not casting on any more items until i finish the ones I have going. I have to get these gifties done! I also will be doing a scarf for my auntie up there, as soon as I figure out what scarf to do, and of course as soon as I finish my 1897329874230 other WIPs. 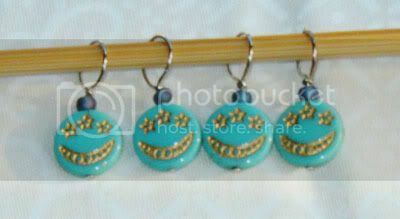 I made some stitch markers today!! These are made with vintage japanese glass beads. These are made with semi-precious snowflake obsidian stone and silver beads. Have you all seen this Google Beta where it offers suggestions as you type in the search? It's like a history bar that comes up, but it is not just yours. And it lists how many results you'll have from each search term. 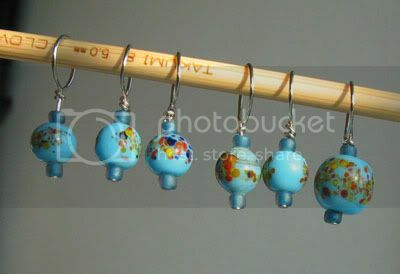 Your stitch markers are SO pretty! I love the beads you found!! !